I had dinner at Gramercy Grill tonight with my parents. It was quite busy for a Wednesday night, so it was a good thing I made a reservation. We were all quite hungry, and unfortunately there was no complimentary bread to chew on. We ordered a basket of bread ($3) along with our entrees. We waited and waited, but our bread didn't come. I finally waved to our server and asked if our bread was coming soon, to which he replied that he was planning to serve all our dishes at once. 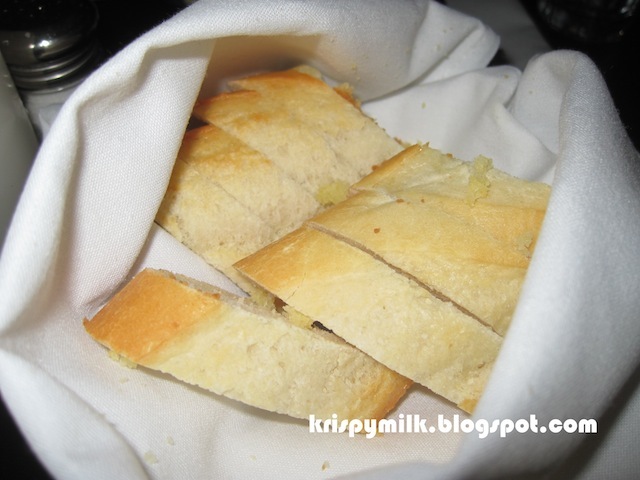 I didn't think it was common practice to serve bread along with entrees, but I guess every restaurant is different. 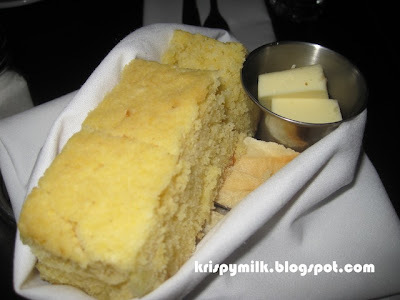 There were 3 large pieces of house-made cornbread which tasted really good. 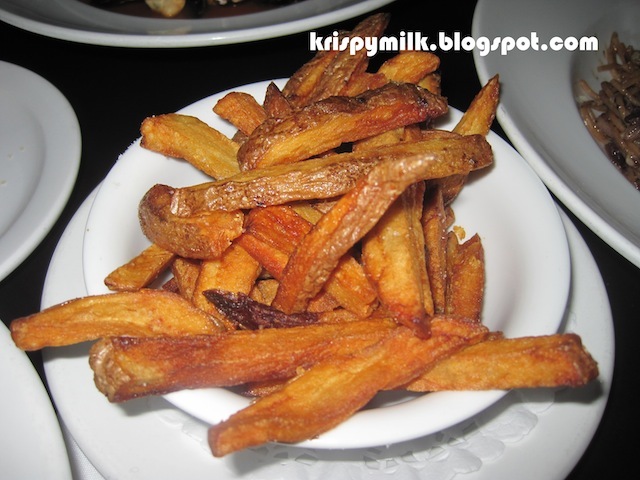 The texture was very soft and crumbly, so it was a bit messy to eat since it fell apart so easily. There were several slices of French baguette hidden underneath the cornbread. The baguette wasn't particularly good, especially in comparison to the buttery cornbread. 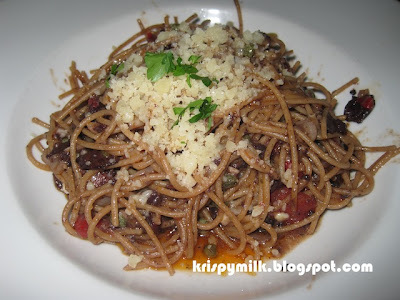 The first entree we had was the wheat spaghetti ($16) with sun-dried tomatoes and mushed up olives. I don't like the taste of olives, but I still found this dish very tasty despite the strong olive flavour. It was a little bit on the salty side though. We ordered mussels and fries ($15), and the mussels were supposed to be served with merguez sausage in tomato sauce. 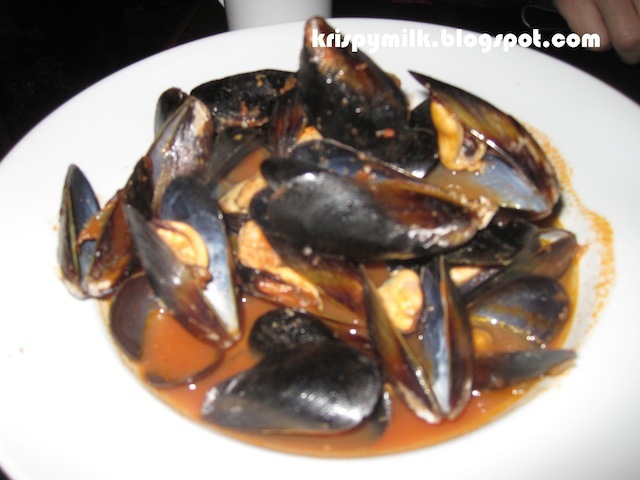 The sauce was tasteless and watery, and the mussels were very small and not juicy at all. The fries looked overcooked, but they actually tasted pretty good despite appearances. 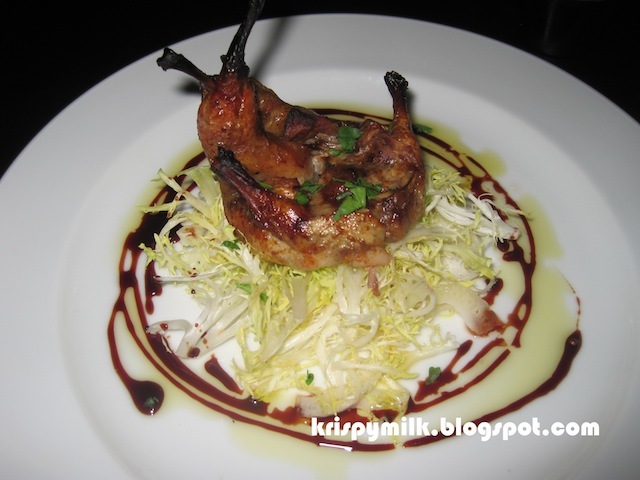 We also tried one of the daily specials which was a quail ($14) served on a sparse bed of salad. This was a disappointing dish as the quail was so skinny that the baking process made it really dry. The skin was tough and the meat was not tender at all. The only dish we liked was the wheat spaghetti. Although the other dishes weren't very good, we still enjoyed the dinner because of the ambiance. The lighting was dim and it seemed like the perfect place for a romantic dinner, or a relaxing family dinner in our case.